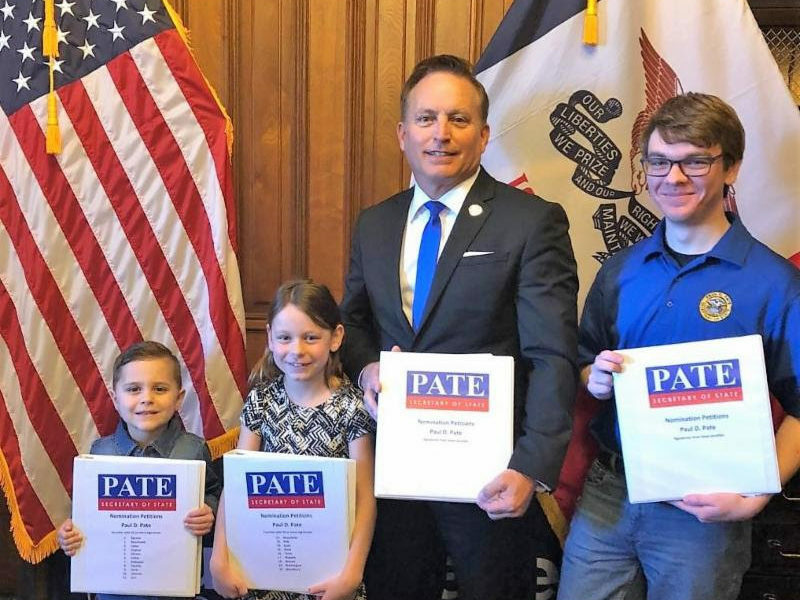 DES MOINES – Iowa Secretary of State Paul Pate officially filed his nomination papers for the 2018 election on Wednesday. Pate’s petitions included signatures from Iowans in all 99 counties, signifying his campaign has already built a strong, statewide grassroots network. Pate’s accomplishments during his current tenure include national recognition for his Iowa Youth Straw Poll and the “Helping Veterans and Iowans with Disabilities Vote” initiative. Pate instituted online voter registration in Iowa in 2016, and his innovations resulted in the highest voter registration total in state history. Paul Pate has dedicated his life to public service. He is a former State Senator, Mayor of Cedar Rapids, and President of the Iowa League of Cities. Pate is currently the Treasurer for the National Association of Secretaries of State. Paul was born and raised in Iowa. He and his wife Jane are parents of three and grandparents of five.